The map-making activity is an attempt to introduce the idea of the relationality of Indigenous knowledge, including mathematics. Indigenous Australians had (and still have in many locations) complex knowledge of their environment and how to navigate around it using the stars and geographical features (Fuller et al. 2014; Australian Aboriginal Astronomy n.d.). They did this, not by using a numerical system as in Western society, but through describing the relationships of different entities, be they hills or constellations. For an oral culture, the journeys of ancestral beings contained much vital knowledge of their environment, even describing sea level rises that occurred 10 000 years ago (Nunn and Reid, 2016). Extensive ecological knowledge, allowed Indigenous people to harvest country sustainably and to safely use fire as a management tool (BOM, n.d.). Indigenous Mathematician Chris Matthews (2012) has developed a technique whereby storytelling is used to create relationships between people and mathematics. By promoting the use of symbols, which can later be transformed into algebraic terms, simple maths stories can be represented through Art, drama and dance. In this activity, the map-making exercise is not only a recognition of the power of story in transmitting knowledge, but also an acknowledgement of the skills demonstrated by Aboriginal people as some of the World’s first cartographers (Jaconline, n.d.). Often knowledge of country could be recorded in a ground map, recording the presence of prominent features, sacred sites, hunting grounds, food sources, campsites and, most significantly, in arid areas, the presence of waterholes. These plan views would traditionally have been drawn in the sand or dirt, but are now a major form of contemporary Aboriginal Art. These maps are deeply personal; describing the journeys, knowledge and relationship of an individual to Country. 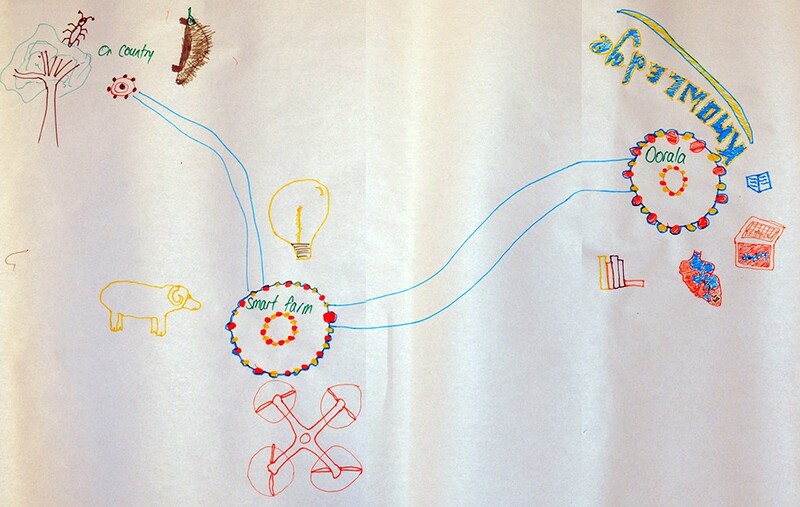 The map-making activity is an opportunity to reflect on the day’s activities and reinforce learning. You are invited to do a drawing of your journey today and the activities you have done during the day, using textas and butchers paper (and pastel crayons if available). It can include the whole journey starting from school, or just the part of the day you spent on country and/at the Smart Farm. You can include the animals you have seen or observed traces of, and even any other animals you know live on the country you visited. For example, our plot was clearly echidna and ant habitat. You can also include drawings of the footprints/tracks of your animals, using the Tracks and Scats book, if available. You may also include the plant species you observed, for example, in our plot there were a lot of stringy bark trees and Blackthorn bushes. Please also include in the picture anything else that you found memorable. For example, we had termite mounds in our plot and also a tree hollow which was probably home to a very small bat. We were also lucky enough to have a Drone that was taking a bird’s eye view of the environment during the day’s activities, so some of our students included that. You can work individually, in pairs or in groups; creating your story through images. If you would like to, you can share your story out loud with other students. 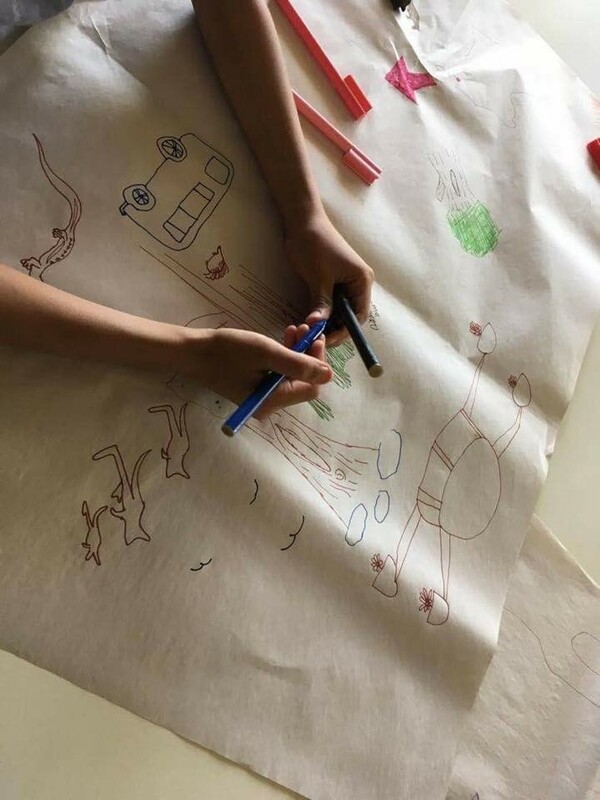 Many students who came to the STEM Day at UNE created maps of their journey all the way from school, including the bus and the Oorala Centre in their drawing; others focused on an animal species, most notably the Echidna. The Echidna was of particular interest as this was the totem of Auntie Lesley Patterson, an Elder from the Banbai nation, who was helping us with our activities. Some students drew maps using traditional Aboriginal symbols for campsites and waterholes. Whilst we did not introduce students to the concept of symbols or planviews as outlined in Jaconline (n.d.) and the Painting Country short video (Australian Screen, 2000), these are resources, which have the potential to enrich this activity. One resource we used was ‘Tracks, scats and other traces: A field guide to Australian mammals’ by Barbara Triggs (1996), which allowed the students to incorporate the tracks of animals species they may have encountered traces of in the field activities. Chris Matthews heads the Aboriginal and Torres Strait Islander Mathematics Alliance (ATSIMA), an Indigenous led, non-profit, member-based group, which aims to inspire improved mathematics outcomes for Aboriginal and Torres Strait Islander students. Retrieved from: http://www.emudreaming.com/, accessed 31 October, 2017. Retrieved from: https://aso.gov.au/titles/documentaries/painting-country/clip2/, accessed 30 October 2017. Retrieved from: http://www.bom.gov.au/iwk/, accessed 30 October 2017. Star Maps and Travelling to Ceremonies--the Euahlayi People and Their Use of the Night Sky. Fuller, R. S., Trudgett, M., Norris, R. P., & Anderson, M. G. (2014)arXiv preprint arXiv:1406.7456. Retrieved from: https://arxiv.org/pdf/1406.7456.pdf, accessed 30 October 2017. Retrieved from: http://www.jaconline.com.au/humanitiesalive/geo1/downloads/HAGeo1_01.pdf, accessed 30 October 2017. Nunn, P. D., & Reid, N. J. (2016). Aboriginal memories of inundation of the Australian coast dating from more than 7000 years ago. Australian Geographer, 47(1), 11-47. Triggs, B (1996) ‘Tracks, scats and other traces: A field guide to Australian mammals’. Melbourne: Oxford University Press, xii + 340 pp. ISBN 0-19-553643-6.